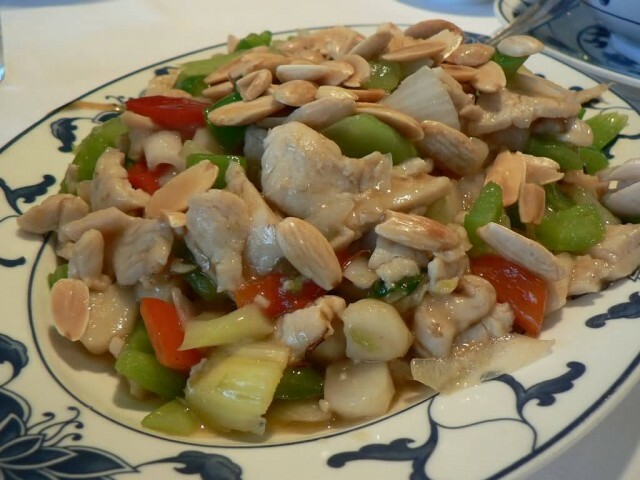 Kung Pao chicken is a spicy stir-fry dish made with chicken, peanuts, vegetables and chili peppers. The dish is found throughout China, there are regional variations that are typically less spicy than the Sichuan serving. 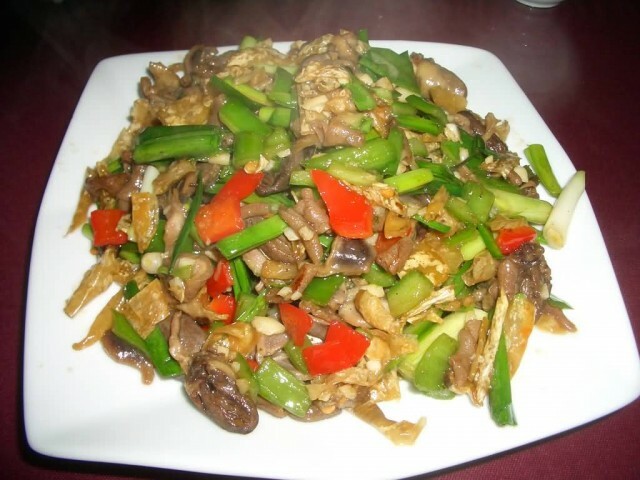 Kung Pao chicken is also a staple of westernized Chinese cuisine. 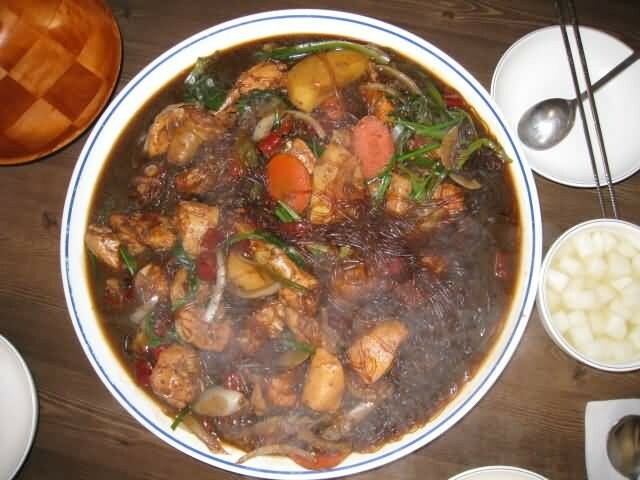 The original Sichuan version uses chicken as its primary ingredient. In this original version, diced chicken is typically mixed with a prepared marinade. The wok is seasoned and then chili peppers and Sichuan peppercorns are flash fried to add fragrance to the oil. Then the chicken is stir fried and vegetables, along with peanuts are added. Shaoxing wine is used to enhance flavor in the marinade. 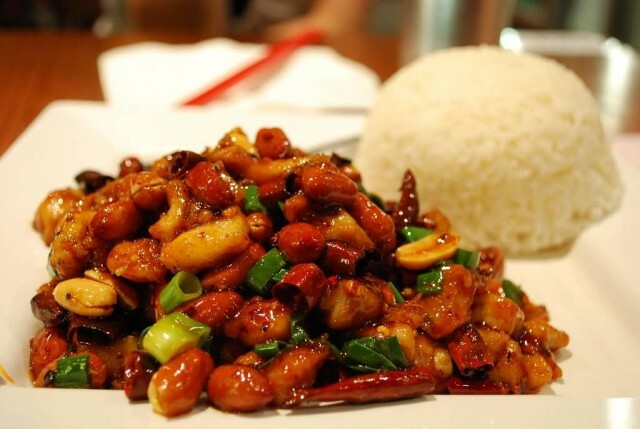 Kung Pao chicken starts off with fresh, moist, unroasted peanuts or cashew nuts. Westwern versions the dish is called as “Kung Pao chicken” or “Kung Po”, consist of diced marinated chicken stir-fried with orange or orange juice, ginger, garlic, chicken broth, sugar, cooking oil, corn starch and salt and pepper to taste. The dish often includes or is garnished with whole roasted peanuts. Andong jjimdak is a variety of jjim (a Korean steamed or boiled dish), which originated in the city of Andong, Gyeongsangbuk-do Province and is made with chicken, various vegetables marinated in a ganjang based sauce. The name literally means “steamed chicken of Andong”. Since Andong jjimdak is cooked over high heat, it has less fat and can have various tastes by adding diverse ingredients according to recipe. 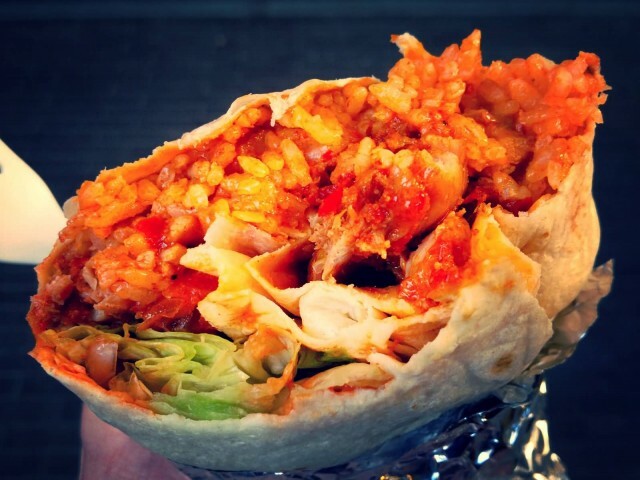 It is popular among students and blue-collar workers due to the abundant portions compared to the price. Andong jjimdak is also considered a nutritious dish due to the high protein content from the chicken and various vitamins provided by the vegetables in the dish. 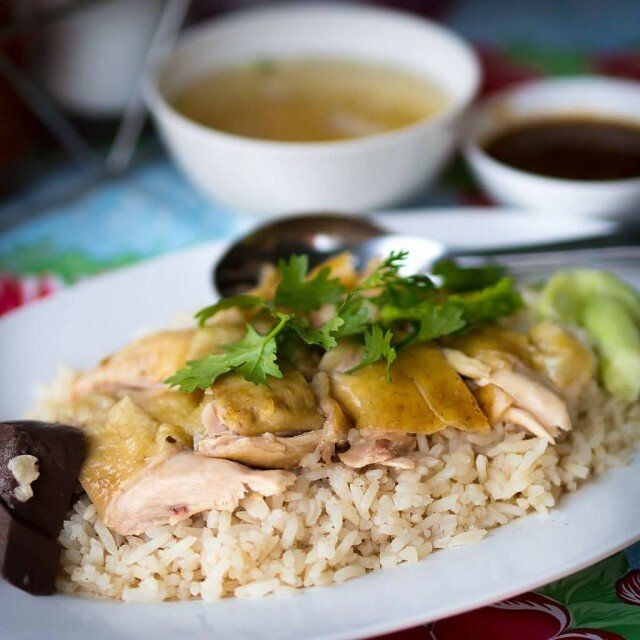 To make the dish, the broth is prepared first by boiling a cleaned chopped chicken, whole garlic, onions, ginger and a type of fresh green chili pepper altogether in a pot. The pepper is famous for its extreme spiciness and plays an important role in tasting the dish. After cooking, the dish is put on a plate and sesame seeds are spread over it. Arroz con pollo (rice with chicken) is a traditional dish of Spain and Latin America, closely related to paella. In the Dominican Republic it is called locrio de pollo and Saint Martin where it is called lokri or locreo. Puerto Ricans consider it one of their classic recipes. 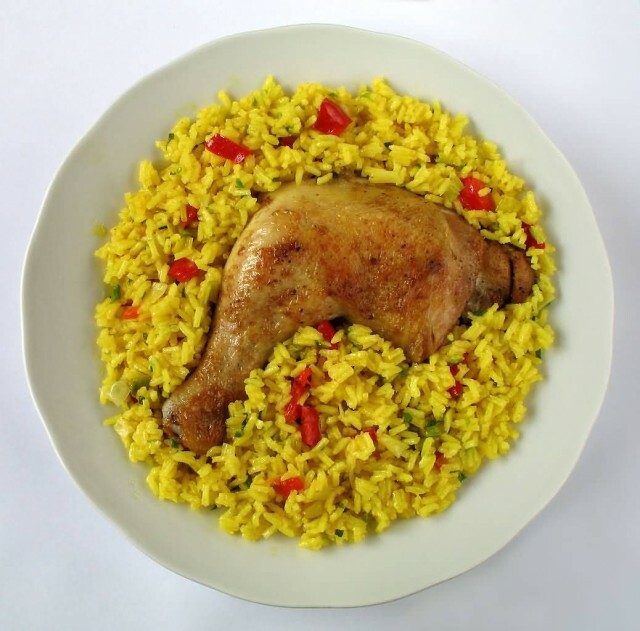 Many Puerto Ricans note that arroz con pollo cannot be made without beer and annatto oil and saffron is no substitute. 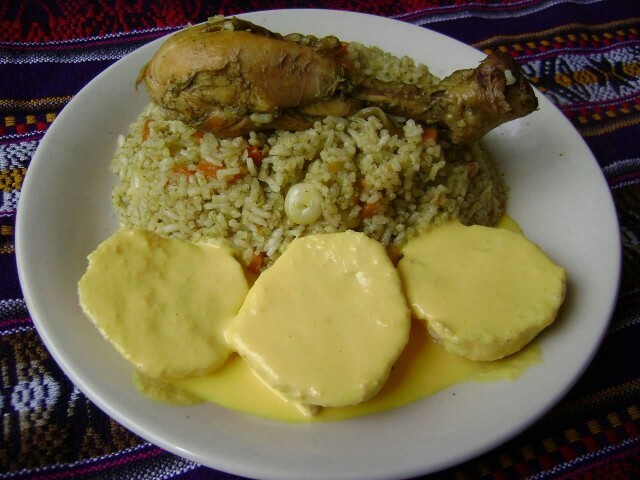 Beer and annatto are rarely used in Spanish cooking and never in arroz con pollo there. Annatto is frequently used in Puerto Rican cooking exceptionally in rice dishes like arroz con gandules (rice with pork and pigeon peas) and arroz con maiz (rice with corn and sausage). Beer is in many Puerto Rican dish like pollo guisado (braised stewed chicken) and asopao de pollo (chicken rice stew). Arroz con pollo and most Puerto Rican rice dish are highly seasoned with sofrito, which is another key ingredient in arroz con pollo. 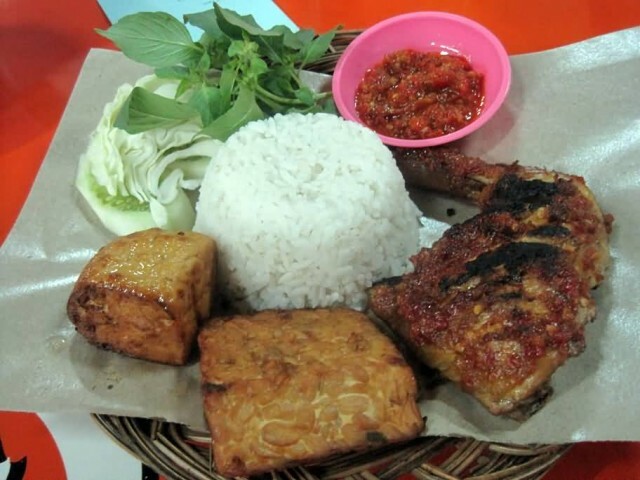 Ayam bakar is a generic term to refer various kinds of Indonesian and Malaysian dish of charcoal-grilled chicken. Ayam bakar literally means “roasted chicken” in Indonesian and Malay. The chicken is usually marinated with the mixture of sweet soy sauce and coconut oil, applied with a brush during grilling. The bumbu spice mixture may vary among regions, but usually it consists of combination of ground shallot, garlic, chilli pepper, coriander, tamarind juice, candlenut, turmeric, galangal and salt. Ayam bakar usually tastes rather sweet because of the generous amount of sweet soy sauce either as marination or dipping sauce, while the ayam bakar Padang, Bali, Lombok and most of Sumatra are usually spicier and more reddish in colour due to the generous amount of chilli pepper, turmeric and other spices and the absence of sweet soy sauce. 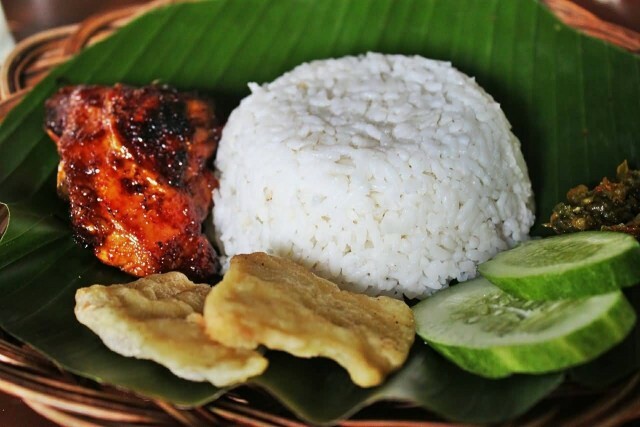 Ayam bakar is usually served with chilli with terasi or sliced chilli and shallot in sweet soy sauce as dipping sauce or condiment and slices of cucumber and tomato as garnishing. 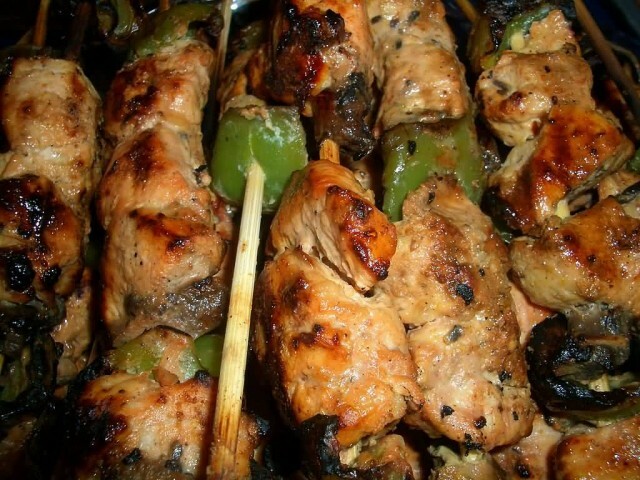 Shish taouk is a traditional shish kebab of Middle Eastern cuisine, which is made in kabab houses in many cities around the world. A similar dish in Persian cuisine is the traditional jujeh kabab. 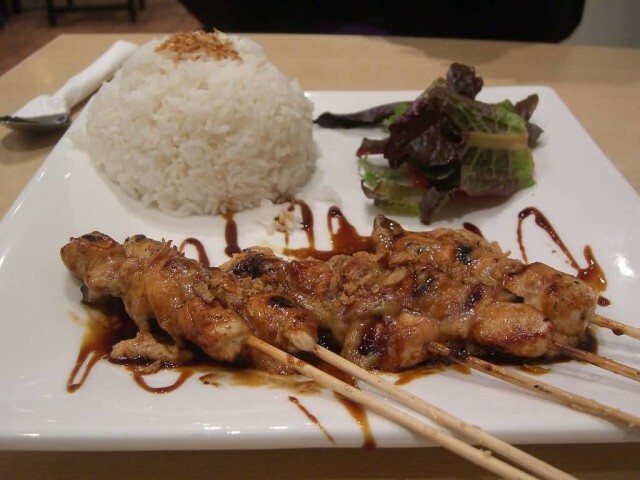 The dish consists of cubes of chicken that are marinated, then skewered and grilled. Common marinades are based upon yogurt and lemon juice or tomato puree, though there are many variations. 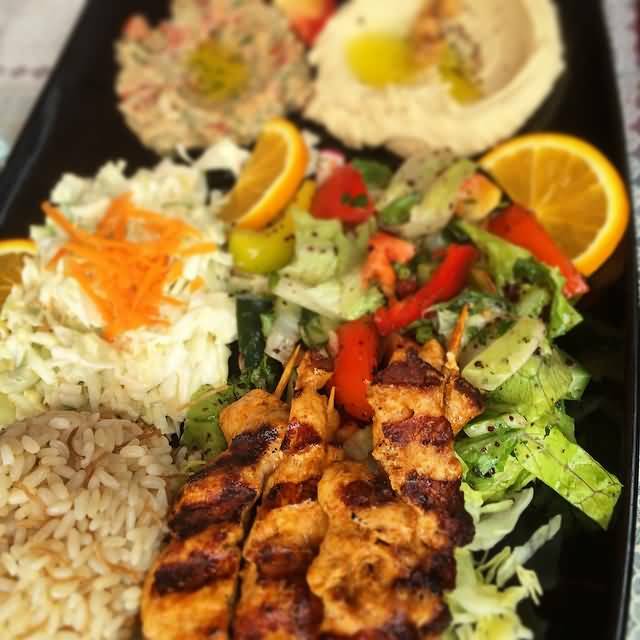 Shish taouk is typically eaten with garlic paste. The Turkish version is generally served with rice and a garlic paste along with vegetables. The sandwich version comes in a flat bread or pita seasoned with garlic paste, frequently accompanied by lettuce, tomatoes and pickled turnips. It is widely eaten in Lebanon, Jordan, Syria, Iraq, the Palestinian Territories and Israel, either as a sandwich or on a platter with vegetables, sometimes with chips/French fries. Chinese chicken salad, as its name suggests, is a salad with chicken and this is most common and popularly adapted in parts of the United States. Though many variations exist, common features of most salads described as “Chinese chicken” contain: cut romaine lettuce and cabbage, chicken, deep-fried wonton or fried rice sticks, noodles, nuts (sliced almonds, cashews or peanuts). A basic vinaigrette for the salad includes ingredients like vegetable oil, sesame oil, rice vinegar, plus, optional seasonings such as dry hot mustard, sesame seeds, coriander and raw ginger or pickled ginger. In restaurants, Chinese chicken salad may be more embellished and offered as an American style “entree salad”, similar to Caesar, Chef, Cobb salads, etc. 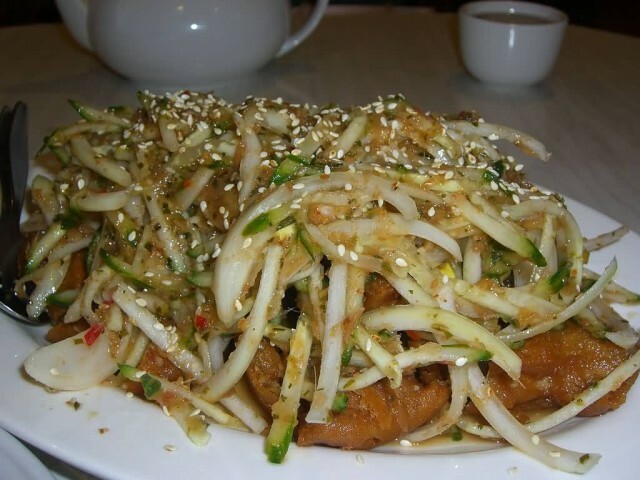 While Chinese Chicken salad and its variations, have also been known as “Asian Chicken Salad” and “Oriental Chicken Salad”; more over, it has as well seen the removal of chicken from the dish and its name. Buldak is a Korean dish made from heavily spiced chicken. 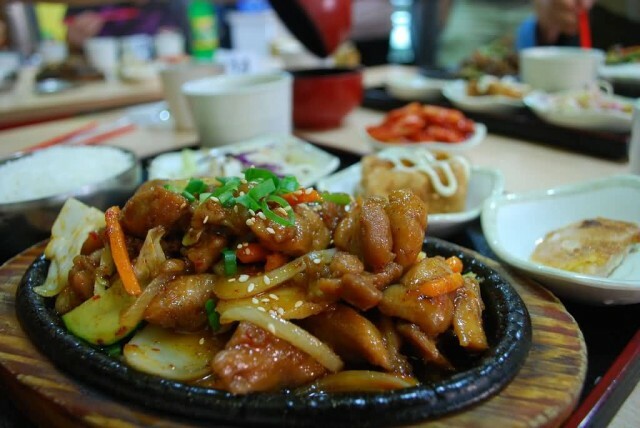 The term “bul” is Korean for “fire” and “dak” translates to “chicken.” A decade ago, buldak became famous for its extreme spiciness. Even some Koreans are unable to eat buldak for this reason. Chicken and tteok (Korean rice cake similar to Japanese mochi) are the main ingredients of this dish. The sauce is a mixture of soy sauce, gochukkaru chili powder, gochujang chili paste, starch syrup, garlic and cheongyang pepper. Sliced chicken and tteok are then, deep fried and mixed up with the sauce. Usually, it is served with nurungji and gyeran jjim. Nurungji is the result of boiling the crust of overcooked rice with water whereas gyeran jjim is a Korean steamed egg casserole. These help to calm down after spicy foods. Also, people usually eat Buldak with alcohol. 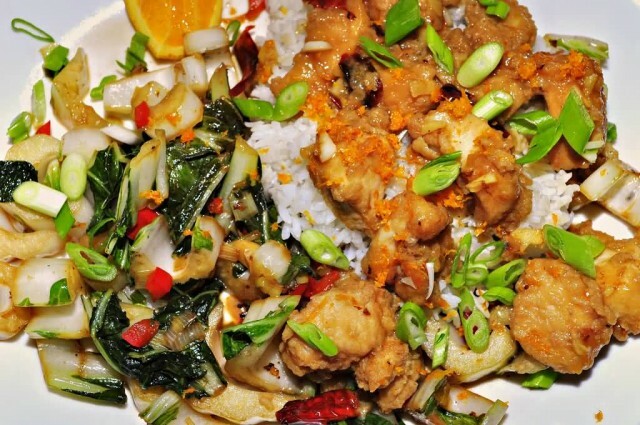 Orange chicken is an American Chinese dish of Hunan origin. 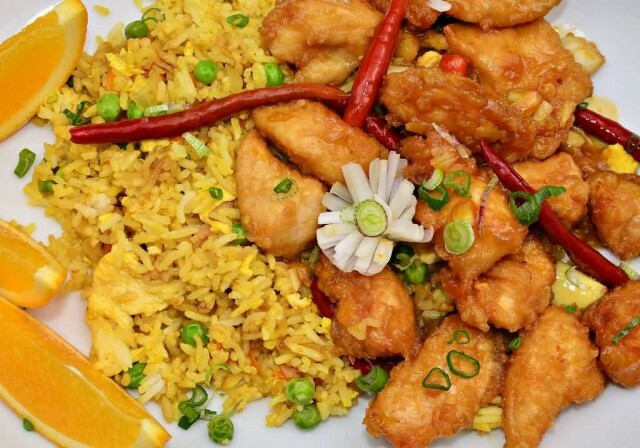 The variety of orange chicken most commonly found at North American fast food restaurants consists of chopped, battered and fried chicken pieces coated in a sweet orange-flavored chili sauce, which thickens or caramelizes to a glaze. 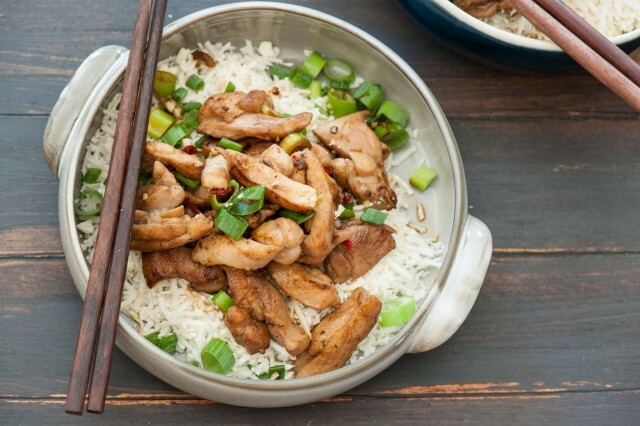 While the dish is very popular in the United States, it is most often found as a variation of General Tso’s chicken rather than the dish found in mainland China. 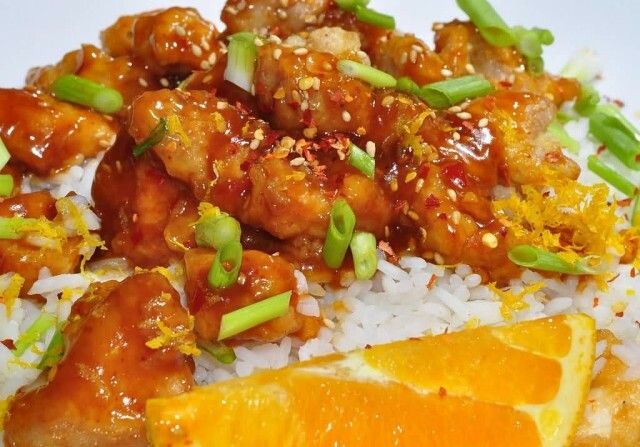 In most countries in the western hemisphere, the names “orange chicken”, “orange peel chicken”, “orange flavor chicken” and “tangerine chicken” are typically used for this particular dish. 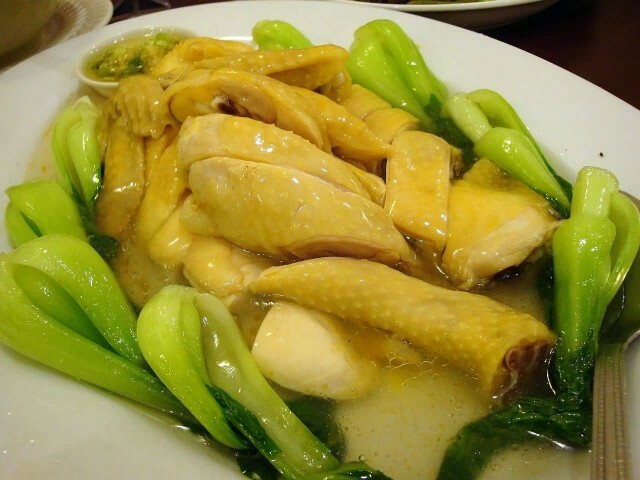 In Chinese, the dish is always known as “old peel chicken”. For restaurants outside of Asia, fresh orange peel is often used instead or even no peel at all. 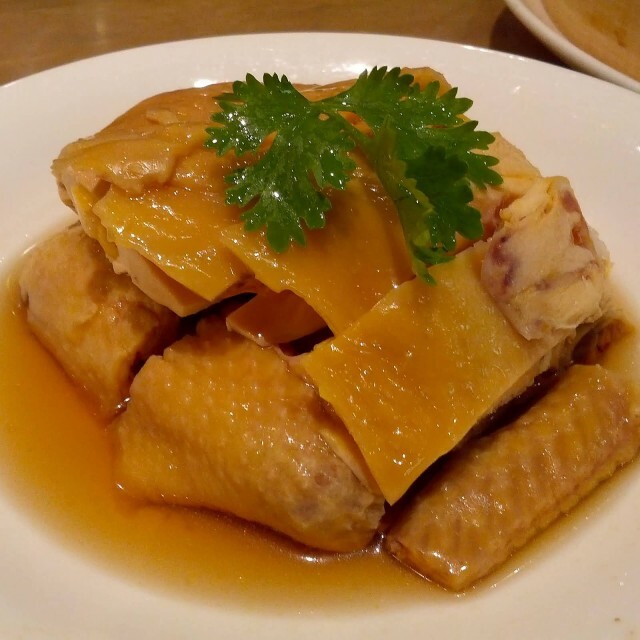 White cut chicken or white sliced chicken is a type of siu mei. Unlike most other meats in the siu mei category, this particular dish is not roasted. 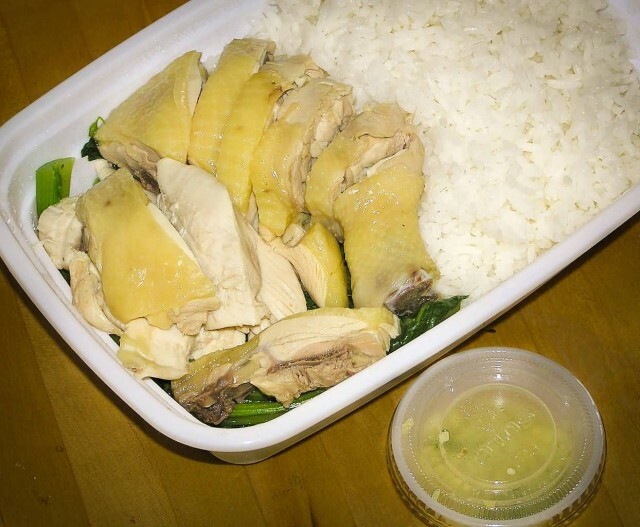 The chicken is salt marinated and is cooked in its entirety in hot water or chicken broth with ginger. Other variations season the cooking liquid with additional ingredients, such as the white part of the green onion, cilantro stems or star anise. When the water starts to boil, the heat is turned off, allowing the chicken to cook in the residual heat for around 30 minutes. The chicken’s skin will remain light-coloured, nearly white and the meat will be quite tender, moist and flavourful. The dish can be served “rare” in which the meat is cooked thoroughly but a pinkish dark red blood is secreted from the bones. This is a more traditional version of white cut chicken that is seldom served in Chinese restaurants anymore. The chicken is usually cooled before cutting into pieces. The chicken is served in pieces with the skin and bone, sometimes garnished with cilantro, leeks and/or a slice of ginger. 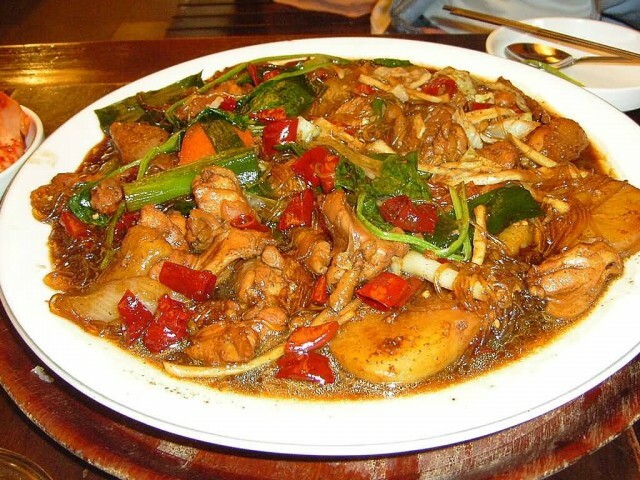 Drunken chicken is the name given to several different ways of preparing chicken using alcoholic beverages. In Chinese cuisine version the whole chicken is first steamed then chopped up into pieces appropriately sized for picking up by chopsticks. 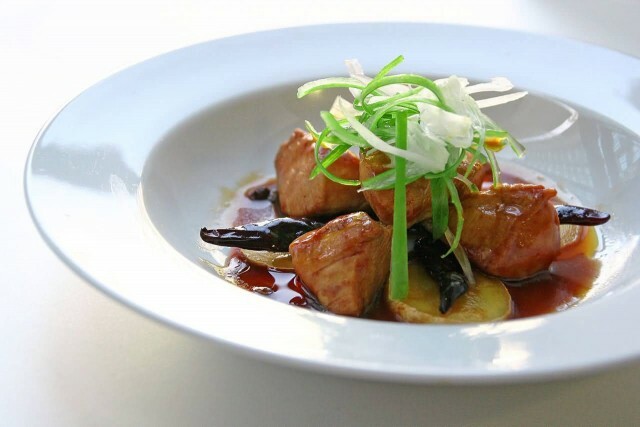 The steamed meat, along with its juice, is cooked with scallions, ginger and salt. After the chicken is cooked it is marinated in Chinese liquor, sherry or a distilled liquor, like whiskey, overnight in the refrigerator. The chicken is served chilled, often as an appetizer. 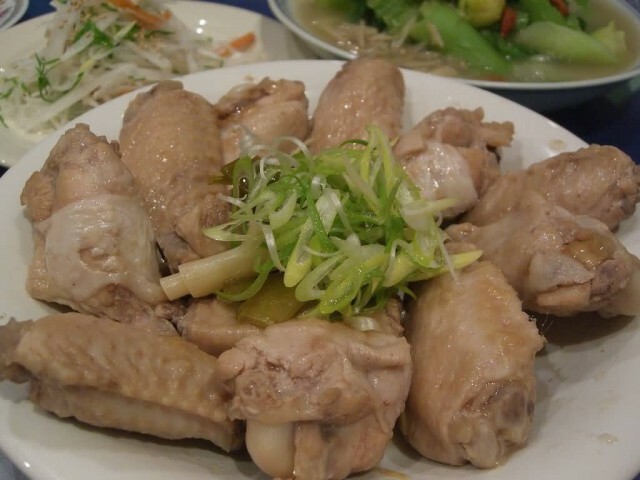 Besides the liquor-flavored meat, another feature of the dish is the liquor-flavored gelatin that results from the chilled mixture of the alcohol and the cooking juices. 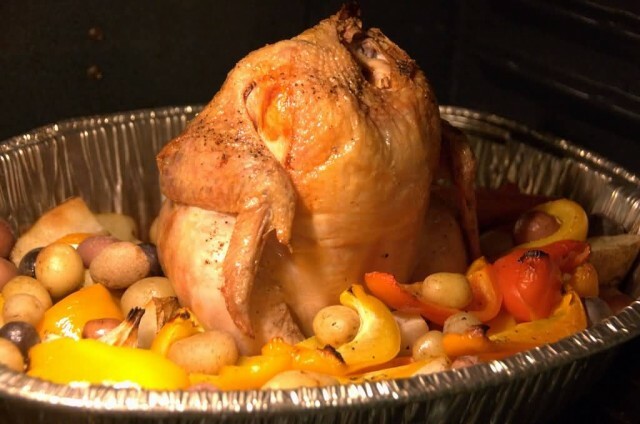 A North American version is made by standing a prepared chicken upright on a partially filled can of beer and cooking it slowly in a barbecue or oven.